"WHO MOVED THE STONE?" or "who ROLLED away the stone?" (Mark 16:3) is a question which has worried theologians for the past two thousand years. Mr Frank Morison, a prominent Bible scholar, tried to nail down this ghost(s) in a book bearing the same title as this tract. Between 1930 and 1975 his book has gone through ELEVEN editions. Through all his 192 pages of conjectures he failed to answer ,"WHO MOVED THE STONE?" (Faber and Faber, London). Ans: The Gospel writers say that she went to "anoint" him. The Hebrew word for anoint is "masaha", which means - 'to rub', 'to massage', 'to anoint'. The word and its meaning are the same in the Arabic language also. From this root word "masaha" we get the Arabic word "MASEEH" and the Hebrew "MESSIAH" both meaning the same thing - "the anointed one" which is translated into Greek as "Christos" from which we derive the word Christ. Q5: DOES IT MAKE SENSE THAT MARY MAGDALENE WANTS TO MASSAGE A ROTTING DEAD BODY AFTER THREE DAYS? Ans: It makes no sense, unless we confess that she was looking for a L-I·V·E Jesus, not a dead one. You will recognise this fact for yourself on analysing her reactions towards Jesus when she eventually saw through his disguise. You see, she had seen signs of life in that limp body when it was taken down from the cross. She was about the only woman beside Joseph of Arimathea and Nicodemus who had given the final (?) rites to the body of Jesus. This man NICODEMUS, somehow, has been deliberately blotted out by the synoptists. The Gospel writers of Matthew, Mark and Luke are totally ignorant of this devoted and self-sacrificing disciple of Jesus. His name is NOT even mentioned in the first three Gospels in ANY context. "it is difficult to avoid concluding that the omission in the synoptic tradition of the mysterious disciple was intentional", says Dr. Hugh J. Schonfield, one of the world's leading Biblical scholars. While the poor, dejected Mary was investigating the sepulchre, Jesus was watching her from the vicinity. Not from heaven, but from terra firma, from mother earth. We must remember that this tomb was a privately owned property belonging to his "secret disciple" Joseph of Arimathea - who was a very rich, influential Jew, and one who could afford to have carved a big roomy chamber, out of a rock which according to Jim Bishop (a Christian scholar of note) was 5 feet wide by 7 feet high by 15 feet deep with a ledge or ledges inside. Around this tomb was this "secret disciple's" own vegetable garden. It is hardly expected of any Jew or Gentile to grow vegetables 5 miles out of town for other peoples' sheep and goats to graze upon! Surely, this husbandman must have provided his labourers with the gardeners' quarters to protect his own interests, and perhaps he also had his 'country home' around the place where he could relax with his family during the weekends. Ans: Can you imagine the scene on the RESURRECTION DAY, that you, dear reader, will be made to look like a "gardener" and your father-in-law will also be transformed into a "gardener" and your son-in-law will also be made to look like a "gardener" and your beloved wife will be left in confusion to find her husband! Does this make sense? No! The resurrected body will be you, yourself! Everyone will readily recognise you. It will be the REAL you and not your camouflage. Never mind at what age or under what condition one dies, everyone will know one another. Then why did Mary think that Jesus was a "gardener"? Ans: Because he had not DIED and was not RESURRECTED. If he had DIED and if he was RESURRECTED he would not have any reason to be AFRAID. Why? Because the resurrected body can't DIE twice. Who says so? The Bible says so: "... it is ordained unto all men ONCE to die, and after that the judgement." (Hebrew 9:27). The idea that the resurrected person cannot die TWICE is further supported by what Jesus Christ had most authoritatively pronounced regarding the resurrection. The learned men of the Jews came to Jesus with a poser, a riddle. They said that there was a woman who had seven husbands in turn. "in the resurrection therefore whose wife shall she be of the seven? For they all had her." (Matthew 22:28). Jesus could have brushed off the Jews with some curt retort because here was another of their tricks to catch him out. Instead, he has enshrined for us the dearest statement in the Bible regarding the resurrected soul. He said, "Neither shall they die any more, for they are equal unto the angels, and the children of God, for such are the children of the resurrection" (Luke 20:36). "NEITHER SHALL THEY DIE ANYMORE" - that they will be immortalised. They will not be subjected to death a SECOND time. No more hunger and thirst. No more fatigue or physical dangers. Because the resurrected body will be 'angelised' - spiritualised - they will become like spirit creatures, they will become SPIRITS. Mary Magdalene was not looking for a spirit. She, taking the disguised Jesus to be a gardener, says, "Sir, if you have taken HIM hence, tell me where have you LAID him..." (John 20:15). Note, she is searching for HIM and not IT - a dead body. Further, she wants to know as to where they had LAID him, not as to where they had BURIED him? So that, "I might take HIM away." (John 20:15). Ans: She is not thinking of a dead, rotting corpse. She is looking for the L-I-V-E Jesus. She is not a "super-woman" of the American comics, who could with ease carry a corpse of at least a hundred and sixty pounds, wrapped with another 'hundred pounds weight of aloes and myrrh' (John 19:39) making a neat bundle of 260 pounds. This frail Jewess was not expected to carry this decaying parcel like a bundle of straws. Even if she could carry it, how was she to bury it ALONE? She might have had to dump it in some hole like a heap of rubbish. But dumping and burying are poles apart. She was looking for a Jesus who was very much alive, a Jesus she could hold by the hand and take him home for rest, relaxation and recuperation, "so that, I might take him away". The joke that Jesus was playing on this woman had gone too far. During the whole course of the dialogue between Mary and Jesus, she did not suspect in the least that she was actually talking to her Master. She had failed to see through the gardener's DISGUISE. Jesus must have been laughing under his breath. He could suppress it no longer. "M·A·R·Y!" he uttered. Only one word, but it was enough. This one word "Mary!" did, all that the exchange of words failed to do. It enabled Mary to recognise Jesus. Everyone has his own unique and peculiar way of calling his or her near one or dear one. It was not the mere sound of the name, but the way he must have deliberately intoned it that made Mary to respond - "Master!, Master!" She lunged forward to grab her spiritual master, to pay her respects and to give reverence. The Muslims, when they meet their learned men, or respected elders or saintly people, hold such person's right hand in the palm of their own hands and fondly kiss the back of the respected one's hand. The Frenchman kisses the cheeks to show respect and the Arab kisses the neck. Mary the Jewess would have done what any Muslim might have done under similar circumstances. Could she not see that the man she was talking to all the time was standing before her? Does it make any sense when he (Jesus) says that - 'HE IS NOT GONE UP', when he is DOWN right here. Ans: What Jesus is telling Mary in so many different words is that 'HE IS NOT RESURRECTED FROM THE DEAD', for in the colloquial language and idiom of the Jew, the expression, "For I am not yet ASCENDED unto my Father" means - "I AM NOT DEAD YET'. It is a sad fact of history that though the Christian Bible is an Eastern Book, full of eastern metaphors and similes, like - "Let the dead bury their dead" (Matthew 8:22) or "Seeing they see not and hearing they hear not" (Matthew 13:13), all the commentators of the Bible have come from the West. The Western World is made to see a Jewish Book, written by the Jews for a Jewish audience, through Greek and Western glasses. An Eastern book ought to be read as an Easterner would read and understand it. All the problems would then be solved. 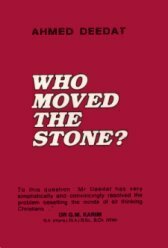 As to the original question of this pamphlet - "WHO MOVED THE STONE?" the answer is so simple and so natural that one is at a loss to understand how this problem has eluded Christian scholars of the highest eminence. The answer to the question, "WHO ROLLED THE STONE INTO PLACE?" is the answer to the title of this tract. "... and HE (Joseph of Arimathea) rolled a stone against the door of the tomb" (Mark 15:46). St. Mark is here supported word by word by St. Matthew who in Chapter 27 and verses 60 states that "... HE (Joseph of Arimathea) rolled a great stone to the door of the tomb and departed". If this ONE man alone could move the stone into place as witnessed by Matthew and Mark, then let me be more generous in adding the name of the other faithful 'secret disciple' - NICODEMUS. It was JOSEPH OF ARIMATHEA and NICODEMUS, the two stalwarts who did not leave the Master in the lurch when he was most in need. These two had given to Jesus a Jewish burial (?) bath, and wound the sheets with the "aloes and myrrh", and temporarily moved the stone into place, if at all; they were the same two real friends who REMOVED THE STONE, and took their shocked Master soon after dark, that same Friday night to a more congenial place in the immediate vicinity for treatment. Reasoning even on the Biblical narration, Jesus was A-L-I-V-E! He had escaped death by the skin of his teeth, as he himself had fortold. Write for your FREE copy of "WHAT WAS THE SIGN OF JONAH? ", as well as for a detailed account of the alleged "crucifixon", under the heading, "CRUCIFIXION or CRUCI-FICTION?" Those of you who have already mastered Lesson No. 1 from the booklet "WHAT WAS THE SIGN OF JONAH?" will now do well to memorise the following verses for your Lesson No. 2. "Jesus saith unto her, Woman, why weepest thou? whom seekest thou? She, supposing him to be the gardener, saith unto him. Sir, if thou hast taken him hence, tell me where thou hast laid him, and I will take him away. "Jesus saith unto her, Touch me not; for I am not yet ascended to my father:...."
The Muslim reader of this and other allied tracts may be tempted to ask, "Do we Muslims need to use the Bible to get at the Truth of God?" These doctrines are expounded in the most unambigious terms in the Holy Qur'an. Why, then, must the Muslim adduce the Christian Scriptures to prove his point of view? This is because we are dealing with a mind which has been programmed from childhood to accept dogmas without reasoning. Today, the Christian is groping for the Truth. He is asking questions which he did not dare to ask a few centuries ago. e) WAS JESUS CHRIST AN IMPOSTER? (A Christian Magazine "Plain Truth" - April '77), etc., etc. In this treatise and others, we have used the Christians' own book of authority, the BIBLE, and his own logic, to refute his claims. This is the system which Allah Subha nahu Wa Ta'aala uses when reasoning with His creatures. The Holy Qur'an commands the Muslim to demand from the Jews and the Christians their authority for their fanciful claims that "SALVATION" is exclusively their right.